“One does not go to see them act,” James Baldwin wrote about the great iconic movie stars, “one goes to watch them be.” It seems obvious . . . Where else besides the movies do you get to see other persons so intimately, so pressingly, so largely? Where else are you allowed such sustained and searching looks as you give to these strangers on the screen, whoever they really are? In life you try not to stare; but at the movies that’s exactly what you get to do, two hours or more—safely, raptly, even blissfully. It’s this sort of amplified, heightened, sometimes transcendent “seeing” that James Harvey explores in Watching Them Be. Marvellously vivid and perceptive, and impressively erudite, this is his take on how aura is communicated in movies. 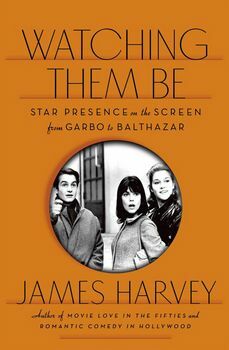 Beginning where Roland Barthes left off with the face of Greta Garbo and ending with Robert Bresson’s Au hasard Balthazar (and its inscrutable nonhuman star), Harvey moves nimbly and expertly through film history, celebrating actors and directors who have particularly conveyed a feeling of transcendence. From Marlene Dietrich to John Wayne to Robert De Niro, from Nashville to Jackie Brown to Masculine/Feminine and the implicitly or explicitly religious films of Roberto Rossellini and Carl Theodor Dreyer, this is one man’s personal, deeply felt account of the films that have changed his life. They will also, Harvey suggests, change yours.